With 300 days of sunshine a year, over 250 art galleries and museums, excellent restaurants, and close proximity to both ancient ruins and natural hot springs, it’s no surprise that Santa Fe, New Mexico continues to be a popular travel destination for family vacations and business travelers alike. A great time of year to visit Santa Fe is the second week of September. It’s at this time each year that Santa Fe holds their wonderful Zozobra Festival, also known as the “Fiestas de Santa Fe”. Zozobra, or “Old Man Gloom” is a giant marionette effigy that is built and burned each year to symbolize the destruction of all your worries and troubles of the previous year. This three-day festival has been celebrates annually since 1712 and has an attendance of over 40,000 each year. We found outstanding Santa Fe hotel lodging discounts and New Mexico hotel lodging specials throughout the state. Follow the links below for the lowest hotel rates in New Mexico. 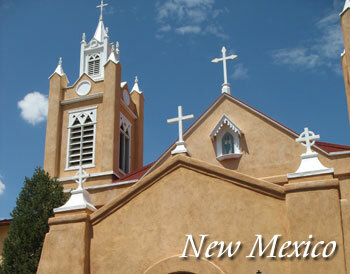 Contact us to feature your New Mexico hotel or lodging property. With its 300 sunny days a year, more than 250 art galleries and museums, excellent restaurants, super lodging selections, terrific skiing conditions and close proximity to ancient ruins, natural hot springs and breathtaking hiking trails, no wonder Santa Fe continues to be an enduringly popular destination for families, couples and business travelers alike. Choose from New Mexico resorts, hotels, motels, and lodges.